thoughts, rants and art! : Starbucks, I'm calling you out. It should be known that I have a love/hate relationship with Starbucks and always have. While for the most part I enjoy their drinks, some of their business practices I do not agree with. If there is a local coffee shop within reach, I'd much rather order my cup of coffee from there. but my doctor has told me a cup of coffee daily is safe (don't worry I don't drink that much naysayers). I needed coffee because my husband woke me up in an odd way and I just couldn't fall back asleep. You see, my sweet Husband, talks/yells/squirms like a worm in his sleep. This morning was no different...he was thrashing around like a fish out of water which made me wake up half way, that's when he yelled "AWFUL" at the top of his lungs, still knocked out. Fair enough, it was time to go get a cup of coffee. We have a Starbucks a few miles from our house and I always feel awkward going there because it seems like it's always full of the Starbucks super fans (the types of people who constantly reload those cards and order all kinds of fancy drinks that I don't understand what they are). Anyway, there was a really nice gentleman, clearly from out of state, in front of me ordering a whole bunch of drinks probably for family members. ... yet I spotted a whole stack of them out of the corner of my eye. Me: "Sir, I have one. You can have mine." Him: "Wow, how nice of you. Thank you so much." I don't get why the cashier would just give him one in the first place, he ordered 4-5 drinks and some breakfast sandwiches. Then with my card, she still didn't give him the silly free drink or discount. Starbucks, you make me crazy. Disclaimer: This story is written below by someone named Casey Cook. I do not know her personally but I do know of this specific Starbucks and have been their numerous times before as I live in the same county. It has been shared 4,774 times on Facebook since November 29th when it apparently took place. I am sharing it because Starbucks has not taken it seriously thus far and I'd like to believe in the power of social media/blogging. "Forgive me for a disturbing post, but I feel compelled to share this story. On the way to get a Christmas tree today, we stopped at Starbucks, just off church circle on main street Annapolis, in the basement of the Maryland Inn. I ordered a Mocha, and got my 3 boys hot chocolates. For Kristjana Knight Cook I ordered a regular black coffee. 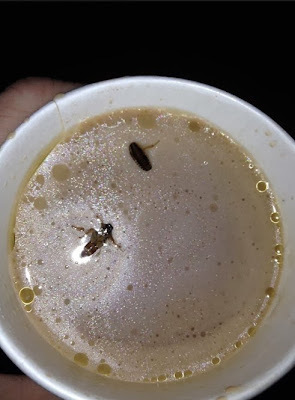 Long story short, all the chocolate drinks including the mocha were infested with bugs, either maggots or roaches. There were several in each up. The nastiest part is that I ingested at least one (how many of you check your mochas for bugs before drinking?). I was sickened and irate that my boys had put their little mouths on this. I brought the drinks back inside. An apologetic barista said that they had just put in a new bag of mocha. "We saw that the box was broken but the bag looked fine." Well it wasn't and there were maggots/roaches throughout the bag. I was stunned that they did not close down the shop. They acted like it was all ok because they had pinpointed the origin of the bugs. But they incomprehensively kept making drinks on the same machine that maggots had just gone through minutes before to make the chocolate milk and mochas! The store manager called me. I told him I was horrified. He agreed I should be. I called the Anne Arundel county board of health. They were closed. Called starbucks corporate, and the person that answered the phone named "Cookie" (seriously) was horrified. I was glad she was. She was sickened by it. And then told me I would be contacted within 48 hours. Ugh. Anyway, I am so disturbed by this. I encourage you all to repost and share this. The address of this starbucks is 16 Church Circle, Annapolis MD (410) 263-2641. I encourage locals NOT to patron this place. Here is one of the photos I took before leaving the store." Casey, then later posted on facebook that all three of her boys were ill and throwing up. Friends, please think about ordering anything mocha related from Starbucks and drink local if you can. oh my goodness, MAGGOTS in the mocha?! that is disgusting. I think I would cry. I've never been a big fan of starbucks either, as they sell their drinks almost as an accessory as opposed to a good cup of joe!